Dutch rabbi; born in Hanover about 1767; died in Amsterdam Dec. 21, 1838. He was the descendant of a long line of distinguished rabbis, his father and his grandfather, R. Aryeh Loeb—who was the son of Rabbi Jacob Joshua of Cracow, Lemberg, and Frankfort (author of the "Pene Yehoshua")—having been rabbis of Hanover. Rabbi Samuel Berenstein was educated as a rabbi, and for many years held that office at Gröningen, Holland. He was probably the first rabbi of Holland to preachin the Dutch language, and a speech which he delivered in 1805 to arouse sympathy for those who were ruined by the great fire that almost destroyed the city of Leyden in that year is preserved in a Hebrew translation ("Ha-Meassef," 1809, pp. 291, 342; 1810, pp. 40 et seq.). Later he became rabbi of Leeuwarden, Friesland, and remained there till 1815, when he was elected chief rabbi of the Ashkenazic community of Amsterdam, to succeed his father-in-law, Jacob Moses Löwenstamm, who had held that position since 1790. There is a tradition that R. Samuel was a trifle too liberal to suit the taste of his zealous father-in-law, and that there were many differences of opinion between them during the time of liberal innovation early in the nineteenth century. A letter addressed by Samuel Berenstein to Israel Jacobsohn, whom he calls "friend of my youth," against the introduction of German prayers in the synagogue (B. H. Auerbach, "Geschichte der Israelitischen Gemeinde Halberstadt," pp. 223-225), is couched in remarkably courteous and liberal terms. Still, neither his orthodoxy nor his skill as a Talmudist is open to the slightest suspicion, as can be seen from a responsum dated 1819, addressed to him by R. Moses Sofer of Presburg. That uncompromising opponent of progress in any form calls R. Samuel "Geon Yisrael," "Ner Yisrael," "'Ammud ha-Yemoni," "Patish ha-Ḥazaḳ," "Kebod Ḳadosh Shemo Tifarto" (see "Ḥatam Sofer"; "Eben ha-Ezer," part ii., responsum 139); the last being an appellation which is used only in the case of the greatest and most pious rabbis. Berenstein is not known to have contributed anything to rabbinical literature; besides a few sermons in the Dutch language ("Leerreden," mentioned by Kayserling, in "Jüd. 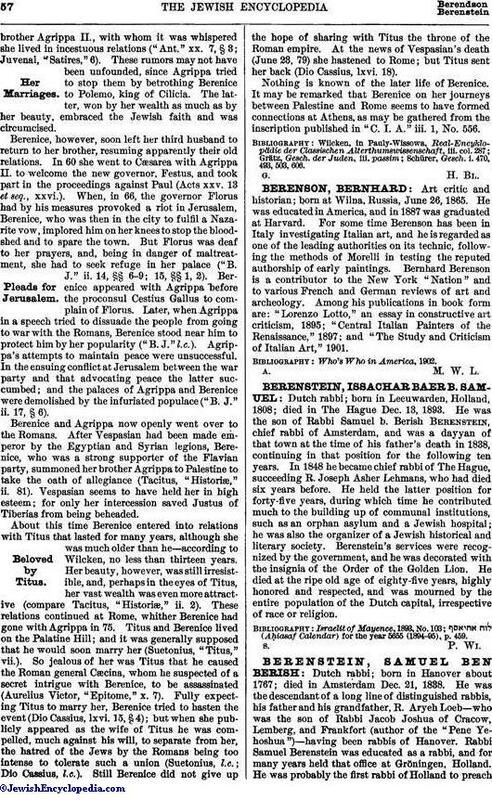 Literatur," p. 103, where it is wrongly stated that he died in 1808)—one of which, delivered in Amsterdam, 1832, is preserved in the British Museum—and a Hebrew prayer against the cholera (Roest's "Catalogue of the Rosenthal Library"), he left nothing for posterity. He will always be remembered in Holland as one of the first rabbis to favor the spread of a knowledge of the Dutch language among the Jews of that country. 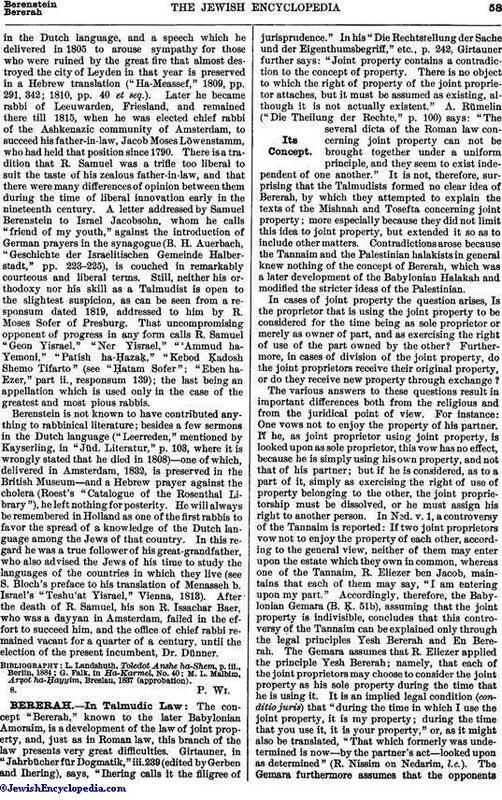 In this regard he was a true follower of his great-grandfather, who also advised the Jews of his time to study the languages of the countries in which they live (see S. Bloch's preface to his translation of Menasseh b. Israel's "Teshu'at Yisrael," Vienna, 1813). After the death of R. Samuel, his son R. Issachar Baer, who was a dayyan in Amsterdam, failed in the effort to succeed him, and the office of chief rabbi remained vacant for a quarter of a century, until the election of the present incumbent, Dr. Dünner. M. L. Malbim, Arẓot ha-Ḥayyim, Breslau, 1837 (approbation).